Creates a new GtkWindow, which is a toplevel window that can contain other widgets. Nearly always, the type of the window should be GTK_WINDOW_TOPLEVEL. If you're implementing something like a popup menu from scratch (which is a bad idea, just use GtkMenu), you might use GTK_WINDOW_POPUP. GTK_WINDOW_POPUP is not for dialogs, though in some other toolkits dialogs are called "popups". In GTK+, GTK_WINDOW_POPUP means a pop-up menu or pop-up tooltip. On X11, popup windows are not controlled by the window manager. If you simply want an undecorated window (no window borders), use gtk_window_set_decorated(), don't use GTK_WINDOW_POPUP. Sets the title of the GtkWindow. The title of a window will be displayed in its title bar; on the X Window System, the title bar is rendered by the window manager, so exactly how the title appears to users may vary according to a user's exact configuration. The title should help a user distinguish this window from other windows they may have open. A good title might include the application name and current document filename, for example. Don't use this function. It sets the X Window System "class" and "name" hints for a window. According to the ICCCM, you should always set these to the same value for all windows in an application, and GTK+ sets them to that value by default, so calling this function is sort of pointless. However, you may want to call gtk_window_set_role() on each window in your application, for the benefit of the session manager. Setting the role allows the window manager to restore window positions when loading a saved session. gtk_window_set_policy is deprecated and should not be used in newly-written code. gtk_window_set_policy (GTK_WINDOW (window), FALSE, TRUE, FALSE) means that the window is user-resizable. gtk_window_set_policy (GTK_WINDOW (window), FALSE, FALSE, TRUE) means that the window's size is program-controlled, and should simply match the current size request of the window's children. The first policy is the default, that is, by default windows are designed to be resized by users. The basic ugly truth of this function is that it should be simply: void gtk_window_set_resizable (GtkWindow* window, gboolean setting); ...which is why GTK+ 2.0 introduces gtk_window_set_resizable(), which you should use instead of gtk_window_set_policy(). If set to TRUE, the allow_grow parameter allows the user to expand the window beyond the size request of its child widgets. If allow_grow is TRUE, be sure to check that your child widgets work properly as the window is resized. A toplevel window will always change size to ensure its child widgets receive their requested size. This means that if you add child widgets, the toplevel window will expand to contain them. However, normally the toplevel will not shrink to fit the size request of its children if it's too large; the auto_shrink parameter causes the window to shrink when child widgets have too much space. auto_shrink is normally used with the second of the two window policies mentioned above. That is, set auto_shrink to TRUE if you want the window to have a fixed, always-optimal size determined by your program. Note that auto_shrink doesn't do anything if allow_shrink and allow_grow are both set to FALSE. Neither of the two suggested window policies set the allow_shrink parameter to TRUE. If allow_shrink is TRUE, the user can shrink the window so that its children do not receive their full size request; this is basically a bad thing, because most widgets will look wrong if this happens. Furthermore GTK+ has a tendency to re-expand the window if size is recalculated for any reason. The upshot is that allow_shrink should always be set to FALSE. Sometimes when you think you want to use allow_shrink, the real problem is that some specific child widget is requesting too much space, so the user can't shrink the window sufficiently. Perhaps you are calling gtk_widget_set_size_request() on a child widget, and forcing its size request to be too large. Instead of setting the child's usize, consider using gtk_window_set_default_size() so that the child gets a larger allocation than it requests. gtk_window_set_default_size is deprecated and should not be used in newly-written code. Sets the default size of a window. If the window's "natural" size (its size request) is larger than the default, the default will be ignored. More generally, if the default size does not obey the geometry hints for the window (gtk_window_set_geometry_hints() can be used to set these explicitly), the default size will be clamped to the nearest permitted size. Unlike gtk_widget_set_size_request(), which sets a size request for a widget and thus would keep users from shrinking the window, this function only sets the initial size, just as if the user had resized the window themselves. Users can still shrink the window again as they normally would. Setting a default size of -1 means to use the "natural" default size (the size request of the window). For more control over a window's initial size and how resizing works, investigate gtk_window_set_geometry_hints(). The default window gravity is GDK_GRAVITY_NORTH_WEST which will typically "do what you mean." If setting is TRUE, then destroying the transient parent of window will also destroy window itself. This is useful for dialogs that shouldn't persist beyond the lifetime of the main window they're associated with, for example. The default widget is the widget that's activated when the user presses Enter in a dialog (for example). This function sets or unsets the default widget for a GtkWindow about. When setting (rather than unsetting) the default widget it's generally easier to call gtk_widget_grab_focus() on the widget. Before making a widget the default widget, you must set the GTK_CAN_DEFAULT flag on the widget you'd like to make the default using GTK_WIDGET_SET_FLAGS(). This function should be used when the user tries to open a window that's already open. Say for example the preferences dialog is currently open, and the user chooses Preferences from the menu a second time; use gtk_window_present() to move the already-open dialog where the user can see it. If you are calling this function in response to a user interaction, it is preferable to use gtk_window_present_with_time(). Presents a window to the user in response to a user interaction. If you need to present a window without a timestamp, use gtk_window_present(). See gtk_window_present() for details. Asks to iconify (i.e. minimize) the specified window . Note that you shouldn't assume the window is definitely iconified afterward, because other entities (e.g. the user or window manager) could deiconify it again, or there may not be a window manager in which case iconification isn't possible, etc. But normally the window will end up iconified. Just don't write code that crashes if not. You can track iconification via the "window-state-event" signal on GtkWidget. Asks to deiconify (i.e. unminimize) the specified window . Note that you shouldn't assume the window is definitely deiconified afterward, because other entities (e.g. the user or window manager) could iconify it again before your code which assumes deiconification gets to run. Asks to stick window , which means that it will appear on all user desktops. Note that you shouldn't assume the window is definitely stuck afterward, because other entities (e.g. the user or window manager) could unstick it again, and some window managers do not support sticking windows. But normally the window will end up stuck. Just don't write code that crashes if not. You can track stickiness via the "window-state-event" signal on GtkWidget. Asks to unstick window , which means that it will appear on only one of the user's desktops. Note that you shouldn't assume the window is definitely unstuck afterward, because other entities (e.g. the user or window manager) could stick it again. But normally the window will end up stuck. Just don't write code that crashes if not. Asks to maximize window , so that it becomes full-screen. Note that you shouldn't assume the window is definitely maximized afterward, because other entities (e.g. the user or window manager) could unmaximize it again, and not all window managers support maximization. But normally the window will end up maximized. Just don't write code that crashes if not. You can track maximization via the "window-state-event" signal on GtkWidget. Asks to unmaximize window . Note that you shouldn't assume the window is definitely unmaximized afterward, because other entities (e.g. the user or window manager) could maximize it again, and not all window managers honor requests to unmaximize. But normally the window will end up unmaximized. Just don't write code that crashes if not. Asks to toggle off the fullscreen state for window . Note that you shouldn't assume the window is definitely not full screen afterward, because other entities (e.g. the user or window manager) could fullscreen it again, and not all window managers honor requests to unfullscreen windows. But normally the window will end up restored to its normal state. Just don't write code that crashes if not. You can track the above state via the "window-state-event" signal on GtkWidget. You can track the below state via the "window-state-event" signal on GtkWidget. By default, windows are decorated with a title bar, resize controls, etc. Some window managers allow GTK+ to disable these decorations, creating a borderless window. If you set the decorated property to FALSE using this function, GTK+ will do its best to convince the window manager not to decorate the window. Depending on the system, this function may not have any effect when called on a window that is already visible, so you should call it before calling gtk_window_show(). disable this button. If you set the deletable property to FALSE using this function, GTK+ will do its best to convince the window manager not to show a close button. Depending on the system, this function may not have any effect when called on a window that is already visible, so you should call it before calling gtk_window_show(). gtk_window_set_frame_dimensions has been deprecated since version 2.24 and should not be used in newly-written code. For windows with frames (see gtk_window_set_has_frame()) this function can be used to change the size of the frame border. gtk_window_set_has_frame has been deprecated since version 2.24 and should not be used in newly-written code. If this function is called on a window with setting of TRUE, before it is realized or showed, it will have a "frame" window around window->window , accessible in window->frame . Using the signal frame_event you can receive all events targeted at the frame. This function is used by the linux-fb port to implement managed windows, but it could conceivably be used by X-programs that want to do their own window decorations. same" window when an application is restarted. So for example you might set the "toolbox" role on your app's toolbox window, so that when the user restarts their session, the window manager can put the toolbox back in the same place. gtk_window_get_frame_dimensions has been deprecated since version 2.24 and should not be used in newly-written code. Retrieves the dimensions of the frame window for this toplevel. See gtk_window_set_has_frame(), gtk_window_set_frame_dimensions(). location to store the width of the frame at the left, or NULL. location to store the height of the frame at the top, or NULL. location to store the width of the frame at the returns, or NULL. location to store the height of the frame at the bottom, or NULL. gtk_window_get_has_frame has been deprecated since version 2.24 and should not be used in newly-written code. Accessor for whether the window has a frame window exterior to window->window . Gets the value set by gtk_window_set_has_frame(). 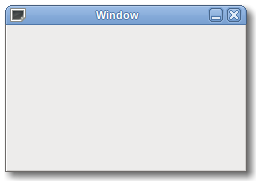 TRUE if a frame has been added to the window via gtk_window_set_has_frame(). Retrieves the list of icons set by gtk_window_set_icon_list(). The list is copied, but the reference count on each member won't be incremented. copy of window's icon list. If you haven't changed the window gravity, its gravity will be GDK_GRAVITY_NORTH_WEST. This means that gtk_window_get_position() gets the position of the top-left corner of the window manager frame for the window. gtk_window_move() sets the position of this same top-left corner. gtk_window_get_position() is not 100% reliable because the X Window System does not specify a way to obtain the geometry of the decorations placed on a window by the window manager. Thus GTK+ is using a "best guess" that works with most window managers. Moreover, nearly all window managers are historically broken with respect to their handling of window gravity. So moving a window to its current position as returned by gtk_window_get_position() tends to result in moving the window slightly. Window managers are slowly getting better over time. If a window has gravity GDK_GRAVITY_STATIC the window manager frame is not relevant, and thus gtk_window_get_position() will always produce accurate results. However you can't use static gravity to do things like place a window in a corner of the screen, because static gravity ignores the window manager decorations. return location for X coordinate of gravity-determined reference point. return location for Y coordinate of gravity-determined reference point. Obtains the current size of window . If window is not onscreen, it returns the size GTK+ will suggest to the window manager for the initial window size (but this is not reliably the same as the size the window manager will actually select). The size obtained by gtk_window_get_size() is the last size received in a GdkEventConfigure, that is, GTK+ uses its locally-stored size, rather than querying the X server for the size. As a result, if you call gtk_window_resize() then immediately call gtk_window_get_size(), the size won't have taken effect yet. After the window manager processes the resize request, GTK+ receives notification that the size has changed via a configure event, and the size of the window gets updated. Note 1: Nearly any use of this function creates a race condition, because the size of the window may change between the time that you get the size and the time that you perform some action assuming that size is the current size. To avoid race conditions, connect to "configure-event" on the window and adjust your size-dependent state to match the size delivered in the GdkEventConfigure. Note 3: If you are getting a window size in order to position the window onscreen, there may be a better way. The preferred way is to simply set the window's semantic type with gtk_window_set_type_hint(), which allows the window manager to e.g. center dialogs. Also, if you set the transient parent of dialogs with gtk_window_set_transient_for() window managers will often center the dialog over its parent window. It's much preferred to let the window manager handle these things rather than doing it yourself, because all apps will behave consistently and according to user prefs if the window manager handles it. Also, the window manager can take the size of the window decorations/border into account, while your application cannot. In any case, if you insist on application-specified window positioning, there's still a better way than doing it yourself - gtk_window_set_position() will frequently handle the details for you. the title of the window, or NULL if none has been set explicitely. The returned string is owned by the widget and must not be modified or freed. Parses a standard X Window System geometry string - see the manual page for X (type 'man X') for details on this. gtk_window_parse_geometry() does work on all GTK+ ports including Win32 but is primarily intended for an X environment. Note that for gtk_window_parse_geometry() to work as expected, it has to be called when the window has its "final" size, i.e. after calling gtk_widget_show_all() on the contents and gtk_window_set_geometry_hints() on the window. Sets up the icon representing a GtkWindow. This icon is used when the window is minimized (also known as iconified). Some window managers or desktop environments may also place it in the window frame, or display it in other contexts. Sets up the icon representing a GtkWindow. The icon is used when the window is minimized (also known as iconified). Some window managers or desktop environments may also place it in the window frame, or display it in other contexts. gtk_window_set_icon_list() allows you to pass in the same icon in several hand-drawn sizes. The list should contain the natural sizes your icon is available in; that is, don't scale the image before passing it to GTK+. Scaling is postponed until the last minute, when the desired final size is known, to allow best quality. Note that transient windows (those who have been set transient for another window using gtk_window_set_transient_for()) will inherit their icon from their transient parent. So there's no need to explicitly set the icon on transient windows. Sets the icon for the window from a named themed icon. See the docs for GtkIconTheme for more details. Note that setting a window's opacity after the window has been shown causes it to flicker once on Windows. gtk_window_position is deprecated and should not be used in newly-written code. GtkWindow:allow-grow has been deprecated since version 2.22 and should not be used in newly-written code. GtkWindow:allow-shrink has been deprecated since version 2.22 and should not be used in newly-written code. The requested opacity of the window. See gtk_window_set_opacity() for more details about window opacity. which gets emitted when the user activates the default widget of window . which gets emitted when the user activates the currently focused widget of window .